We are an international group of activists working for peace at a critical moment in Northeast Asia. Earlier this fall, we gathered in solidarity from around the world for a five-day gathering called “Peace for the Sea.” As the second annual international peace camp of its kind, its goal was to promote inter-island solidarity among our communities in Jeju Island of South Korea; the islands of Taiwan; and Okinawa and other Ryukyu Islands, including Miyakojima, Ishigaki, Yonaguni and Amami-Oshima. Ichariba chōde (行逢りば兄弟) is an Okinawan proverb that carries a special resonance for our group, meaning “Once we meet, we become brothers and sisters.” We already share a kinship of historical memory as survivors, witnesses, descendants, and advocates. Indeed, the Ryukyu Islands, the islands of Taiwan, and Jeju Island all bear legacies of suffering, given our parallel experiences of Japanese colonial occupation and postwar authoritarian rule in the shadow of the Cold War under US hegemony. Furthermore, the security of Taiwan has long been used as an excuse for the stationing of troops in Korea and Japan. As we mark 70 years since the end of World War II in the Asia-Pacific, we are still struggling against the unresolved contradictions of both that conflict and the Cold War, while also contending with the emerging reconfiguration of bipolar rivalries into a New Cold War. Truly, it is more pressing and necessary than ever to strengthen our solidarity as a transnational community of peace. In the spirit of Ichariba chōde, we have sought to strengthen our solidarity as a sisterhood and brotherhood of peace. Following our first “Peace for the Sea” program in Jeju last year, we could not have anticipated the urgency of being in Okinawa this autumn. On the day that we arrived for our Peace Camp in late September, the railroaded passage of war bills by the Japanese Parliament marked a grave turning point, forsaking the country’s longstanding pacifism, despite massive protests throughout Japan. Shortly thereafter Okinawa’s Governor Onaga Takeshi spoke in front of the United Nations Human Rights Council in Geneva. 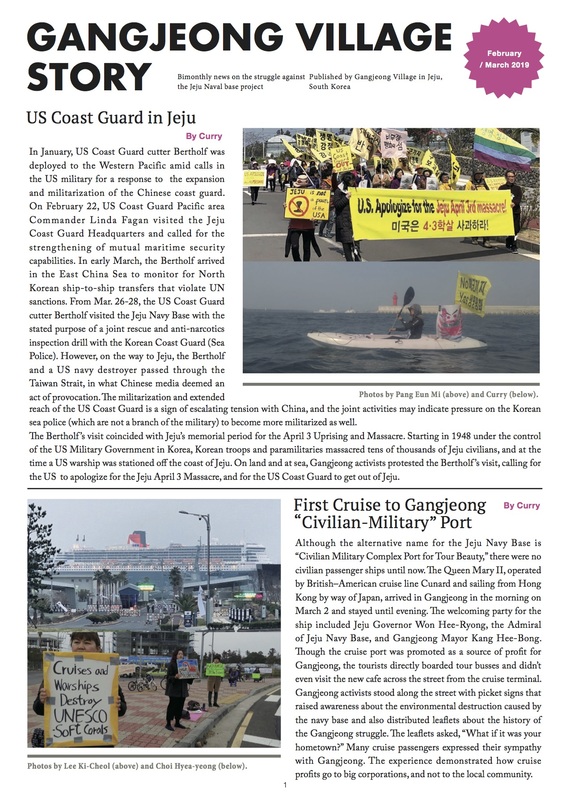 He said, “The building of the new base in Henoko is a violation of the right to self-determination of the Okinawan people.” During that same period in Korea, an Aegis destroyer entered the Gangjeong Sea for the first time to conduct a test-mooring in the harbor of the naval base that is nearing completion, foreshadowing the end of Jeju’s identity as an Island of Peace. As we know by now, these alarming developments are all related to the “Asia pivot,” which the Obama Administration first announced five years ago. This term commonly refers to the policy of redirecting US foreign policy and military strategy away from the Middle East and toward countries in Asia and the Pacific Rim, in response to the rise of China. But what it really means is the escalating confrontation of two hegemons, the US and China, competing for control over the last resources on earth. Truly, 2015 is a year that has seen a breakneck expansion of the region’s militarization on a scale that is unprecedented. We fully understand that this shift will not bring about greater human security but will instead yield the conditions for a far greater risk of war and tremendous environmental destruction. We further recognize that these changes have been fueled by the global weapons industry, which reaps enormous profits from increased military tension and conflict, while ordinary people and the wider ecosystem suffer the inevitable consequences. Amid such developments in the globalization of the weapons industry, Taiwan is also implicated as a consumer through its obligation to purchase millions of dollars in US arms through the secondary market, as stipulated by Taiwan’s treaty of mutual cooperation with the US (i.e. the Taiwan Relationship Act). Many of us have come to Okinawa for the first time, and our hosts taught us the Okinawan saying, “Nuchi du takara” (ヌチドゥタカラ – 命ど宝), meaning “Life is a treasure,” or “Nothing is more precious than life.” What at first sounds like a simple life-affirming phrase is in fact shadowed by the harrowing experience of mass death during the Battle of Okinawa. In this way, “Nuchi du takara” is also a message of profound resilience: Bearing the memory of devastating tragedy and hardship, the response of Okinawan people has been to embrace life unequivocally. So we, too, are today facing mortal threats to the collective peace in our region, and similarly our response must be to affirm the coexistence of all living creatures and to build a strong transnational community of friendship and solidarity. We are all part of nature and have the responsibility to protect the water, land, and air upon which we depend to survive. We condemn the degradation of the natural environment and the structural violence committed against island residents and other marginalized peoples, whose interests have too often been sacrificed for the sake of exclusive and destructive forms of nationalism, or global capitalism in the guise of nationalism. ■ We demand a stop to military exercises, which are escalating regional tensions, wasting precious resources, and leading to the mass beaching of sea mammals. ■ We demand a stop to dredging to make new artificial islands, a process that destroys marine ecologies. ■ We demand a stop to the naval base construction at Gangjeong. ■ We demand a stop to the helipad construction at Takae. ■ We demand a stop to the radar base construction at Yonaguni. ■ We demand a stop to the plans for base construction at Ishigaki, Miyakojima, and Amami-Oshima. ■ We demand a stop to the plans for base construction at Henoko. We invite more people – both in East Asia and throughout the world – to join us in taking the initiative to promote peace. Toward this vision, we will continue to work closely together, and we look forward to the third international peace camp next year in Taiwan. We cannot leave this work to political leaders and governments, which largely answer to corporate interests and the military-industrial complex. We challenge the prevailing assumptions behind the current configuration of geopolitics that takes for granted the precedence of nation-states, military interests, and capitalist accumulation. We will instead create another kind of geography. Through our peace camp and similar projects, we are already creating alternative political communities based on a sustainable economy, the ethics of coexistence, and our shared responsibility to preserve peace.